L’oreal Paris is by far my favourite high street brand not only for makeup but also skin care. They have such a great range of products with amazing quality and great prices that it is difficult not to love this brand. 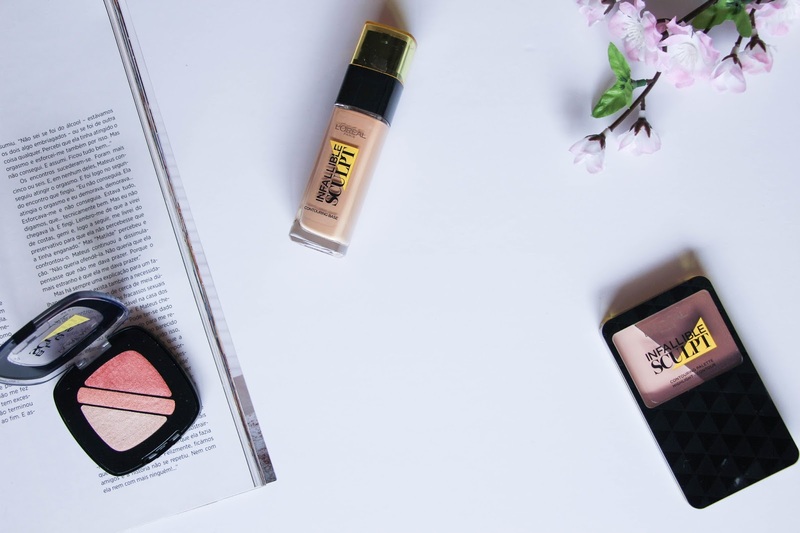 Not long ago they came up with a new range, the Infallible Sculpt and with me being a lover of the L’oreal Infallible 24h Stay Fresh Foundation, I was feeling very positive about this range and let me tell you in advance that I am not disappointed. The L’oreal Infallible Sculpt Contour Base is a medium to full coverage foundation that, as the name says, is the base for a perfect contour. With only two shades to choose from (but hopefully with more coming soon), this foundation will give you the coverage that you need without feeling too thick or heavy on your skin. I dot it all over my face with my finger and either use the beauty blender to apply or my favourite foundation brush, the Real Techniques Sculpting Brush and it blends effortlessly onto my skin. I have it in the shade Medium Dark (03) that matches perfectly with my olive toned skin. In terms of durability, this foundation is quite long lasting without fading throughout the day. I was quite impressed with that as even the L’oreal Infallible 24h Stay Fresh Foundation tends to fade specially on my chin and this new one does not do that. The finish is quite matte and I do like that. To add some glow, it is enough to use a dewy primer like the L’oreal Paris Lumi Magique Primer and you will be ready to go. Next, the L’oreal Infallible Sculpt Contouring Palette. Let me tell you that this was the product I was most excited for. For ages that I have tried to find a drugstore cream contour palette but all I came across was powder contour palettes. L’oreal just upped their game with this contour palette. Again, with only two shades to choose from, it is not enough for all the different skin tones we have out there but it is definitely an amazing start. I have the Light/Medium palette that gives you a nice grey toned contouring shade that it is perfect and does not look too overdone and the lightest shade that although it has a pink undertone, it does the job. The shade I am most impressed with is definitely the darkest one. It turns to be perfect as a contouring shade for me giving me shadow and definition to my cheekbones and it is also great to contour your nose. I have used this palette a few times and I am still getting the hang of it but loving it so far! I apply the lightest shade to my chin, bridge of my nose, middle of my forehead and under my eyes in a downwards triangular shape. Then, the darkest shade I apply to my cheekbones, jawline, sides of my forehead and nose too. To blend, I use the Real Techniques Miracle Complexion Sponge starting with the lightest color and moving to the darkest. The product is very creamy and so it is also very easy to blend, something that helps a lot if you are a beginner in cream contour like me. While the Contouring Base would be something I would reach for everyday as an everyday foundation, the L’oreal Infallible Sculpt Contouring Palette will be something I will keep for when I am going out and want a more sculpted, contoured complexion. Last but not least, the L’oreal Paris Infallible Blush Sculpt, a trio contouring blush that you have the option to choose between three shades. I have it in the shade 101 Soft Sand Ambre, a beautiful coral blush trio that you can either use all together for a more natural look or individually for a sophisticated result. I personally like to use it all together and it gives a nice pop of colour and shine to the apples of my cheeks. Very natural, easy to blend and with a nice pigmentation, there is not much to say about this. The lightest shade is also perfect to use it as an highlight and I love how it looks. This will definitely be a blush that I would reach for during this spring and summer. And this is it, the three products of the newest L’oreal Paris range – Infallible Sculpt. I personally love them and can’t get enough on how good L’oreal products are. If you never tried these, you should definitely give them a go. Promise you won’t regret , and you can thank me later!